Blue is a very versatile colour and is available in so many different shades and tones that you would be spoilt for choice to choose the right colour for your home. 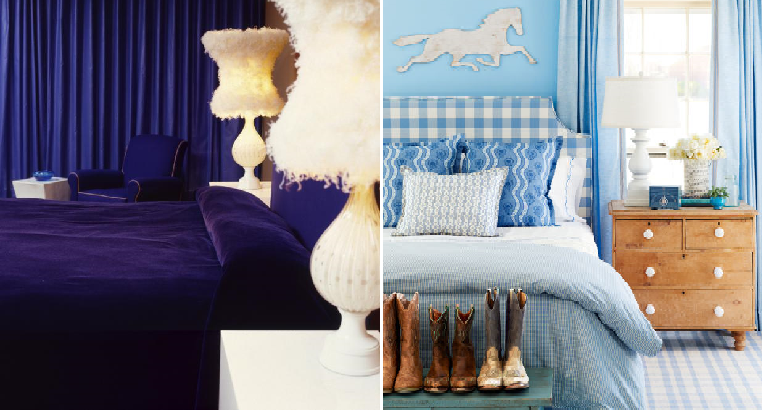 It can go well with so many other colours or just go ahead and deck out the whole room in various different shades of blue to really make it look outstanding. The blue in this room is subtle and stylish as it highlights different elements of the room but not to the extent that it is overpowering everything else. The chic sky blue kitchen matches well with the deep blue kitchen island while the baby blue hue on the walls completes the look. This study uses blue as its main colour superbly well with the dusky blue wallpaper that is offset with some quirky wall art. The chairs and lamp uses similar patterns in blue and white to keep it looking less formal while the steel desk is laid with a blue coaster. This deep and rich shade of blue makes the space look really opulent even if the accessories used to decorate are simple. A velvety soft sofa in the rich cobalt blue draws your attention while the curtains uses a similar shade. The look is completed with slightly darker walls with shining patterns. This vivid colour is a great colour to use to brighten up a dark space and this kitchen simply looks gorgeous in this shade. The decor is kept from looking too monotonous with the help with shining white sink and some stainless steel fixtures. Make your mornings much better with this cheery bathroom that is sure to perk you up. The bright blue on the wall suits the tiled blue floor while the bunch of blue flowers freshens up the space. The fairly large window lets in enough natural light to make it look more warm. This cosy bedroom is covered with patterns of different types in blue and it works amazingly well. The soft periwinkle blue is used to its best advantage is various elements of the room while the wooden bedside drawers and white lamp makes it look more interesting. Cobalt blue is a very rich colour that can make your room look really luxurious especially when you use the right textures. This grand bedroom is an oasis of extravagance with velvet bedding while the white tables and fluffy lamps brighten up the space. This is a very understated shade of blue and is good to use if you prefer a more subtle approach in decking our your home in this awesome colour. This bathroom’s walls are wrapped in a wallpaper with a midnight blue pattern but it is brightened up with light blue cabinet, white sink and shiny gold furnishings.